If I had to pick my least-favorite tax loophole, the economist part of my brain would select the healthcare exclusion. After all, that special preference creates a destructive incentive for over-insurance and contributes (along with Medicare, Medicaid, Obamacare, etc) to the third-party payer crisis that is crippling America’s healthcare system. But if I based my answer on the more visceral, instinctive portion of my brain, I would select the deduction for state and local taxes. As I’ve previously noted, that odious tax break enables higher taxes at the state and local level. Simply stated, greedy politicians in a state like California can boost tax rates and soothe anxious state taxpayers by telling them that they can use their higher payments to Sacramento as a deduction to reduce their payments to Washington. What’s ironic about this loophole is that it’s basically a write-off for the rich. Only 30 percent of all taxpayers utilize the deduction for state and local taxes. But they’re not evenly distributed by income. Here’s a sobering table from a report by the Tax Foundation. The beneficiaries also aren’t evenly distributed by geography. 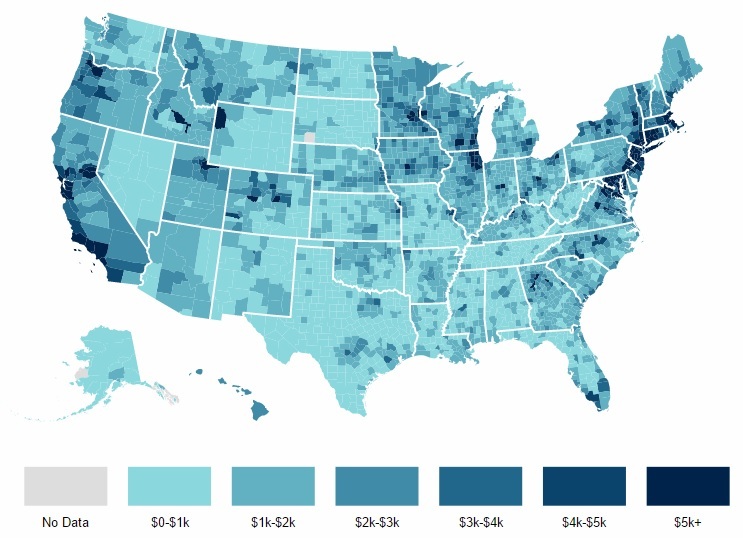 Here’s a map from the Tax Foundation showing in dark blue that only a tiny part of the country benefits from this unfair loophole for high-income taxpayers. As you can see from the map, the vast majority of the nation deducts less than $2,000 in state and local taxes. But if you really want to see who benefits, don’t simply look at the dark blue sections. After all, most of those people would happily give up the state and local tax deduction in exchange for some of the other policies that are part of tax reform – particularly lower tax rates and less double taxation. And I suspect that’s even true for the people who hugely benefit from the deduction. 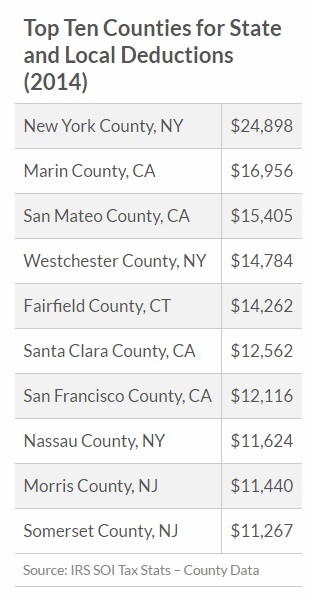 The biggest beneficiaries of this loophole are concentrated in a tiny handful of wealthy counties in New York, California, New Jersey, and Connecticut. 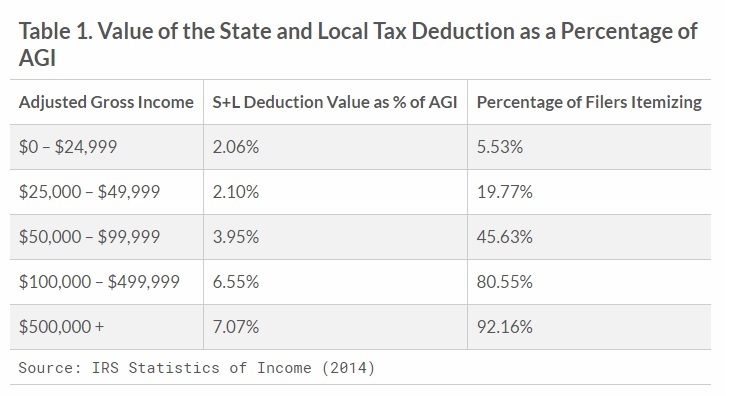 As you can see, they reap enormous advantages from the state and local tax deduction, though I suspect these same people also would benefit if tax rates were lowered and double taxation was reduced. Regardless of who benefits and loses, there’s a more fundamental question. Should federal tax law be distorted to subsidize high tax burdens at the state and local level? Kevin Williamson of National Review says no. …the deduction of state taxes against federal tax liabilities creates a subsidy and an incentive for higher state taxes. California in essence is able to capture money that would be federal revenue and use it for its own ends, an option that is not practically available to low-tax (and no-income-tax) states such as Nevada and Florida. It makes sense to allow the states to compete on taxes and services, but the federal tax code biases that competition in favor of high-tax jurisdictions. The Governor of New York, by contrast, argues that the tax code should subsidize his profligacy. It would be “devastating on the state of New York, California, et cetera, if you didn’t allow the people of this state to deduct their state and local taxes,” Cuomo told reporters… State and local governments have been working to preserve the deduction, and they argue that doing away with the preference would hurt states and localities’ flexibility to make tax changes. Gee, anyone want to guess how that “flexibility” is displayed? Though at least the reporter acknowledged that the deduction is primarily for rich people in blue states. …the deduction…is viewed as disproportionately benefiting wealthy people. It also tends to be used in areas that lean Democratic. And that’s confirmed by a 2016 news report from the Wall Street Journal. Repealing the federal deduction for state and local taxes would make 23.6% of U.S. households pay an average of $2,348 more to the Internal Revenue Service for 2016. But those costs—almost $1.3 trillion over a decade—aren’t evenly spread… Ranked by the average potential tax increase, the top 13 states (including Washington, D.C.), as well as 16 of the top 17, voted twice for President Barack Obama. 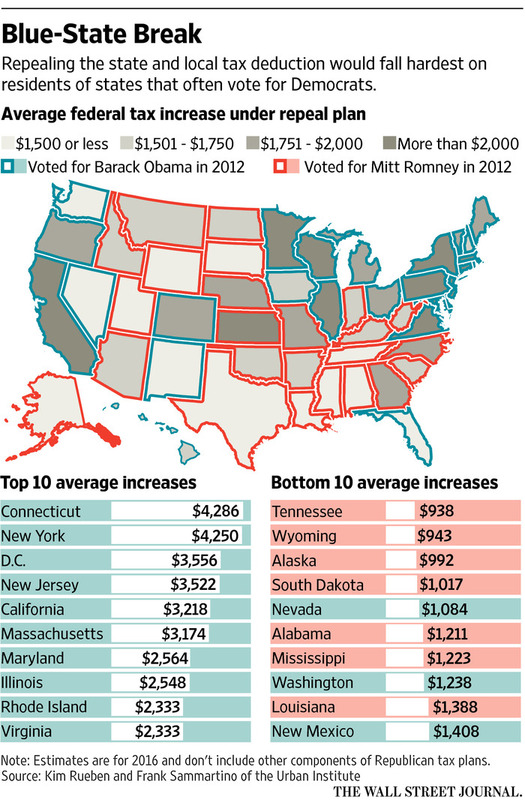 …And nearly one-third of the cost would be paid by residents of California and New York, two solidly Democratic states. …President Ronald Reagan tried repealing the deduction as part of the tax-code overhaul in 1986, but he was rebuffed by congressional Democrats and state officials. …Republicans argue that the break subsidizes high state taxes, because governors and legislators know they can raise income taxes on their citizens and have the federal government pick up part of the tab. …half the cost of repealing the deduction would be borne by households making $100,000 to $500,000, using a broad definition of income. Another 30% would be borne by households making more than $1 million. Under the GOP plans, residents of high-tax states wouldn’t necessarily pay more in federal taxes than they do now. They would benefit from tax-rate cuts. Here’s one final image that underscores the unfairness of the deduction. 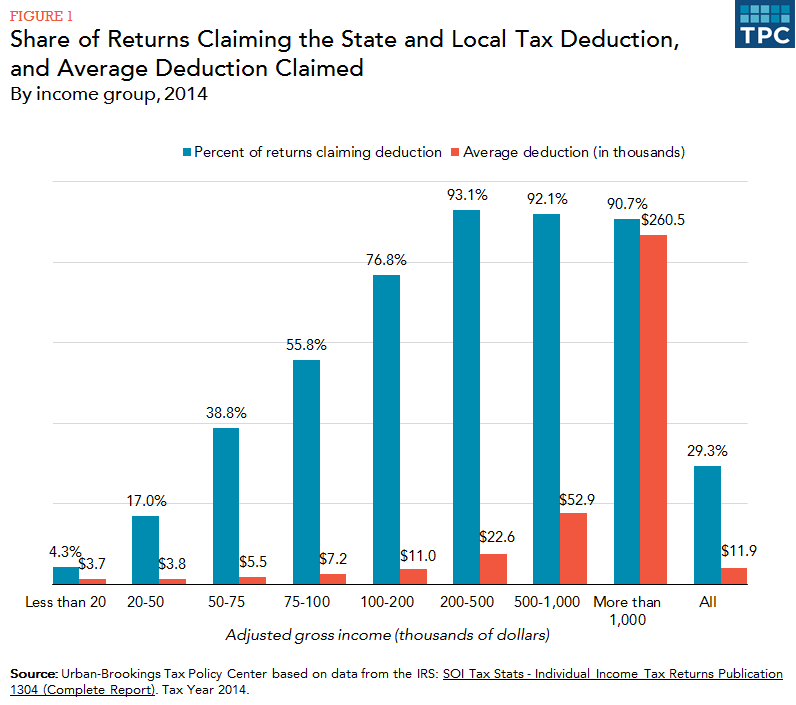 The Tax Policy Center has a report on the loophole for state and local taxes and they put together this chart showing that rich people are far more likely to take advantage of the deduction. And it’s worth much more for them than it is for lower-income Americans. How much more? Well, more than 90 percent of taxpayers earning more than $1 million use the deduction and their average tax break is more than $260,000. By contrast, only a small fraction of taxpayers earning less than $50 thousand annually benefit from the deduction and they only get a tax break of about $3,800. Yet leftists who complain about rich people manipulating the tax system usually defend this tax break. It’s enough to make you think their real goal is bigger government. I’ll close by calling attention to the mid-part of this interview. I shared it a couple of days ago as part of a big-picture discussion of Trump’s tax plan. But I specifically address the state and local tax deduction around 3:00 and 4:30 of the discussion. P.S. In addition to the loophole that encourages higher taxes at the state and local level, there’s also a special tax preference that encourages higher spending at the state and local level. Sigh. P.P.S. Now, perhaps, people will understand why I want to rip up the current system and replace it with a simple and fair flat tax. – Local government knows better if some local action should be taken. – Implementing new policy ideas locally allows many experiments to be run. Means less risk and greater chance for good ideas to surface. – Makes government more accountable to the people, because people can move if they don’t like the government they are getting. – Overall better transparency, accountability, and efficiency. I think the far better solution would be means-testing tax rates by ZIP code. No reason a guy making $500k in Wichita (where that’s real money) pays the same as a guy making $500k in Manhattan (where you can’t actually live with a a family on $500k). If you changed brackets so that top x% of earners paid 39.6%, etc., you’d have a tax system that didn’t wildly penalize city dwellers. Separately, the Economist ran a piece a few yrs ago showing NY state had net transferred $1trillion from 1989-2009 to the rest of the country; they’re paying for the $69k per capita ND received in the last few years in federal transfers…CA was no. 2 with $500bn, given to the rest of the country. more than their fair share. I don’t understand how the write off of state and local taxes benefits the “rich”. Higher income earners are subject to the alternative minimum tax. Under the AMT, you lose your deduction for state and local taxes. What am I missing? Politicians have to resort to various ways of relieving the most competent from heavy taxation, because we are already operating in the flatter part of the Laffer curve, and, more importantly, way beyond the peak of the Rahn curve — which at current economic growth trajectory will transform American voters into middle income citizens of a middle income country by mid century. When coercive collectivism hits the Laffer curve, and thus runs out of competent people’s money, it inevitably must consume its core supporters, the more mediocre. Sooner or later, the people, the voter-lemmings, will get the VAT they deserve. Politicians talk venom against the productive minority to get elected, but their economists remind them that Laffer effects limit revenue collectible from the most competent — necessitating that they eventually direct taxation towards their core supporters. But “America is a rich country. It sure can afford more taxes, even though it’s trendline growth rate has fallen to half the world average”. That is the mentality of doom.